Japan is pretty at any time of year, but it’s somehow even more beautiful at springtime. That’s when the world-famous sakura (cherry blossom) burst forth, transforming the country into a fantasyland of soft-pink blooms. This postcard-perfect itinerary connects travelers with Japan’s rich cultural history at its most picturesque time of year. After settling in, the tour begins with a privately guided full-day tour of the Tokyo of old. Largely spared by Allied bombs during World War II, the Asakusa and Yanaka districts retain much of the city’s pre-war character. Here, you’ll find two important landmarks – Senso Temple and the Meiji Shrine, tour the Shitamachi Museum, stroll Ueno Park, and visit the bustling Ameyoko-cho market. 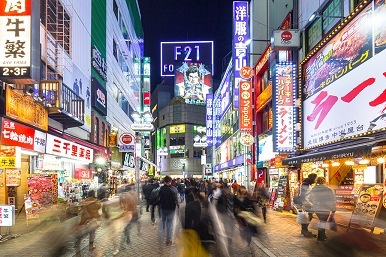 Later, meet Tokyo’s colorful modern side on a private afternoon tour of the Shibuya, Harajuku, and Akihabara districts, famous for their markets, anime shops, and outré street style. 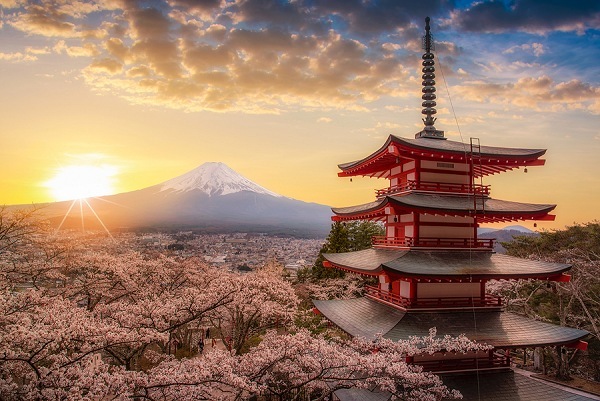 Next, bid the big city goodbye and connect with nature on a private excursion into Fuji-Hakone-Izu National Park, home to stunning volcanic landscapes, an incredible cable car, and black eggs boiled in the region’s sulfuric hot springs, a local delicacy. After a trip by train to Kyoto, you’ll sit down to a special treat: a private dinner with a geisha hosted and translated by Peter Macintosh, an expert in Japanese culture. Kyoto is the heartland of traditional Japanese culture, and you’ll discover its serene beauty on a privately guided tour with stops at a pair of UNESCO World Heritage sites – Kinkaku Temple and Nijo Castle – before dropping by the famous Nishiki Market. The tour ends with a proper send-off: a private tour of the gardens, bamboo groves, tea houses, and shrines (including the historic Nonomiya Shrine and UNESCO-protected Tenryu Temple) of the scenic Arashiyama district on Kyoto’s western fringe, followed by a privately guided half-day stroll along the exquisite Philosopher’s Path, one of the very best places to take in the splendor of the cherry blossoms in all of Japan. Conveniently located in the heart of the city, Mandarin Oriental, Tokyo enjoys a bird’s eye view of the breathtaking city skyline. Surrounded by the chic shops and offices of Nihonbashi, the hotel exudes crisp, cutting-edge style with state-of-the-art technology, a renowned spa, award-winning restaurants and impeccable service. The guestrooms are a blending futuristic luxury with a sense of space, capture the essence of Japanese style and design. A stay in Gora Kadan, a former holiday retreat for the imperial family in the National Park Hakone, is an invitation to bring your five senses to life by submerging yourself in Japan’s most ancient way of life. A true highlight for foodies – it is renowned for serving one of the best ‘kaiseki’ dinners in all of Japan. In these calm and pleasurable settings, located in an area of springs heated by volcanic sources, you may move from your suite with its minimalist design, to a swimming pool or spa while wearing a Yukata cotton kimono. 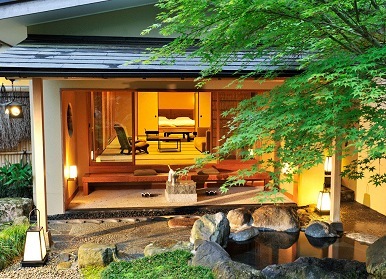 Discover the style and vibe of today’s Japan with an 800-year-old ikeniwa (pond garden) at its heart – intimate, contemporary Four Seasons Hotel Kyoto, in the scenic district of temples. Within light-filled, spacious guest rooms and select Private Hotel Residences, experience personalized, insider access to Kyoto’s four-season delights. Double-height windows frame our tranquil garden as you enjoy modern European brasserie dining. Sip local craft beers on the waterside terrace. Cross the glass bridge for matcha in the Tea House. Float in the indoor pool then melt into bliss in the Spa. Please note that the best time to visit Japan for cherry blossoms would be the final 2 weeks of March, and the first 2 weeks of April. Accommodations during this period book up extremely early, and booking a minimum of 6 to 12 months in advance is required. Tour operator reserves the right to substitute similar properties for late bookings. Prices are subject to change and are based on availability. To book your Japanese Holiday, call Susan Rogers in our Vacations Department. You can reach her at (678) 420-2510 or email her at vacations@teplis.com.